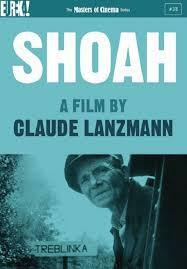 Claude Lanzmann’s film Shoah is unforgettable. Not because of what it says. But because of its refusal to say anything at all. The theme of Shoah is the Holocaust, in which over six million Jews were murdered by National Socialist Germany. But to state the theme in this way is to already go beyond the film. Shoah can be classed as a documentary, in that it features interviews with real people about events to which they were eyewitnesses. But it does not document anything, or try to explain anything. If there is a message, it must be worked out by the viewer, in subjective imagination. Which puts the question to me. I first saw this nine-hour marathon some thirty years ago. Strongest in my memory were certain points of silence. One was the endless camera take of rusty railway lines running through bleak Polish landscapes. Another was the strange German barman whom Lanzmann waylaid while he was filling glasses in a Munich beer cellar. I wanted to see the film again. I wanted to revisit those railway lines and their overwhelming desolation, and re-examine that Munich barman, whose wholly absent facial expression had made him seem so much less less alive, though filmed in colour, than the face in the black and white photograph with which Lanzmann had surprised him. When Claude Lanzmann died some weeks ago (5 July, 2018), and his life and work were celebrated in the media, Shoah was made available again for viewing. I had my chance. By now, I was better informed. I knew that railways had becomea potent, and widely recognised, symbol of German technical mastery, which had been put to so evil a purpose, and with such total effect, that mass murder could be practised on an industrial scale and many of those who played a role in it could claim afterwards, to their own satisfaction, at least, that they did not know what was going on. The Munich waiter, I had learned, was Josef Oberhauser, a former SS man, and I knew why he was in the film. Oberhauser had made a contribution to some of the worst of the Nazi atrocities. He had lent a willing hand with the early T4 euthanasia operations against Germany’s mentally-retarded and mentally-ill, and again with Aktion Reinhardt in Poland and the Ukraine, to which over two and a half million Jews fell victim. Later, Oberhauser commanded the Risiera di San Sabba in Trieste, the only concentration camp on Italian soil, where many thousands of Jews and other persecuted persons were murdered. As captured on film by Lanzmann, it is difficult to imagine how the taciturn dimwit at the beer taps could have been officer material, or entrusted with a command. But by this time, Oberhauser was a broken man. After the war, he had been jailed by the East Germans. Upon his release, he was able to go home to his native Bavaria, but the West Germans jailed him again. Shortly before he was filmed for Shoah, he had been sentenced in absentia to life imprisonment by the Italians. Hardly uplifting experiences. Earlier photographs show a happier individual. Kennen Sie dieser Mann! Lanzmann demands of Oberhauser in his pungent, ungrammatical German. Do you know this man! I use the exclamation mark, because, though grammatically a question, the words, with Lanzmann’s rather sinister intonation, lack any sense of invitation or dialogue. It is a command, and the camera focuses on the photograph which Lanzmann is holding up, that of a man in SS uniform. It is Christian Wirth, Oberhauser’s superior officer, dead since 1944. Like Oberhauser, Wirth was a graduate of the T4 euthanasia programme. Let loose on the Jews, he invented the carbon monoxide gas chamber, which was used in the early phase of the Holocaust. 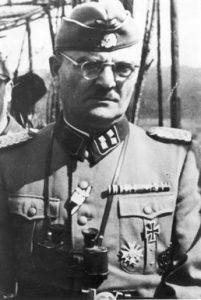 He later became the inspector of concentration camps for Odilo Globocnic, the SS general who ran Aktion Reinhard. When this monstrous operation was completed, Globocnic was posted to Trieste. He took Wirth with him, and Wirth took Oberhauser. A perfectionist and a sadist, Wirth was much given to the casual ill-treatment of those around him. ‘Christian the Cruel’ and ‘Christian the Barbarian’ they called him. Things went so far, it is said, that some of his own men killed him, and blamed it on the partisans. There all kinds of reasons why Josef Oberhauser might not take kindly to being reminded of his old superior officer. Some of them have to do with the film. Lanzmann’s interviewing practices were highly intrusive. He gave false names. He used misleading pretexts to approach his subjects. He deployed hidden cameras and ignored promises of confidentiality. His behaviour was unethical. I don’t know how I would react if somebody accosted me in my workplace with a camera team and waved a photograph in my face. If my reaction was recorded on film, I don’t think I would look my best. If that filmed event was then shown publicly without my permission, I would feel embarrassed, and I would consider myself unjustly treated. If I was told to put up and shut up, because I was a war criminal and had no right to be treated with fairness, I might well ask myself what was supposed to have changed since the collapse of the Third Reich, if the old methods were still in place. Am I now on the side of Josef Oberhauser? I am not defending him. But I refuse to add my voice to the choirs of millions that have already condemned him. I do not feel good in the judgment seat. There are Oberhausers everywhere. Men with a rudimentary education and poor life prospects, whose sense of who they are is bound up with prejudice and resentment. Put such a man in a uniform, let him feel special for a change, give him a little bit of power, tell him what do with it, and he will see you as his conscience and his mind, and will follow you without thinking. 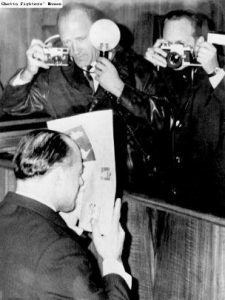 For Josef Oberhauser, it must have been quite a puzzle that by doing his duty he would end up in a succession of courtrooms, having to answer for the deaths of over 450,000 people. Kennen Sie dieser Mann! Josef Oberhauser saw little sense in killing Jews. And he had clear knowledge that it was morally wrong. We know this, because he said so. Still, he helped to get the killing done. Not with unusual cruelty, but with enthusiasm for his work. When he was brought to justice, he made every effort to wriggle out of it. He co-operated only when it was unavoidable. His sole concern was to get off as lightly as possible. The court in Munich tried him not as a murderer, but as an accomplice, which was in keeping with German judicial practice. The court concluded that because Oberhauser had procured the materials to build the gas chambers at Belzec concentration camp, he must share the responsibility for the deaths there. His personal closeness to Christian Wirth and the many commendations he had received were proof that he did not act under duress. A harsh judgment, in some ways. In other ways, it was very lenient. But there is truth to it. We have an inner life. That inner life matters. The subjective conviction that something is wrong means that it is wrong. We have to end our involvement. Immediately. Josef Oberhauser is long dead. In Lanzmann’s Shoah, he lives on. Unwillingly. Let us hope that at some point in his journey he managed to look in the mirror and behold himself without distortion. Even in a death camp, one can begin to make amends.